Sopapilla Cheesecake combine the taste of sopapillas and cheesecake, and you have a fabulous dessert, called sopapilla cheesecake. I first tried this sopapilla cheesecake dessert at a pot luck dinner. 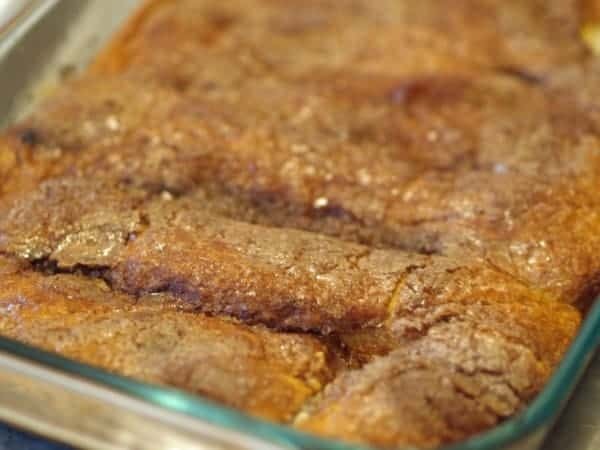 This is so easy to put together, you combine Pillsbury Crescent rolls, and a cheesecake filling, and top with a delightful cinnamon and sugar topping. I brought this sopapilla cheesecake to a party, and it was a hit. Are you looking for the perfect dessert to bring to a pot luck or a party? This is the dessert for you. Do you like cheesecake? This recipe combines the best of cheesecake and a wonderful south of the border sweet flavor. I have never brought this treat to a party and come home with anything left in the dish. Even if you aren’t a seasoned baker, you can put together this scrumptious dessert quickly, and everyone will be asking you for your recipe. Whenever I make this Sopapilla Cheesecake the pan never comes back empty. Line the bottom of a 9 x 13 casserole dish with 1 can of rolls. The dough can be stretched a bit to cover the bottom of the dish if you roll it out with a rolling pin the pre-cut lines will disappear. In a medium-sized mixing bowl combine cream cheese, 1 1/2 cups of sugar, vanilla, lemon zest, and lemon juice. Spread this over the layer of crescent rolls in the baking dish. Spread the remaining can of crescent rolls over the cream cheese layer. Combine 2 teaspoons of cinnamon and 1/2 cup of sugar in a small bowl, mix to combine. Sprinkle the cinnamon and sugar over the top layer of crescent rolls and then drizzle all with melted butter. Bake for 30 minutes or until the top is lightly browned. If you really want to send this dessert over the edge, you may want to serve this with a scoop of vanilla ice cream. Would this recipe work with lowfat crescent rolls and fat free cream cheese? Do left overs go in fridge? I forgot to put mine in last night 🙁 just wondering of its still good. You should keep it in the fridge, depending on the temp in your house it may be ok. Excuse me.. what are cresent rolls? It is a type of refrigerated roll that you bake. A friend brought this desert to a potluck dinner and I wanted to eat the whole thing!!! Awesome. If you used phyllo dough, be sure to butter the layers, otherwise you would get a dry, pasty mess. Just wanted to thank you for this super easy, delicious recipe. First time I ever did a semi-homemade dessert for my blog after doing a search for Sopapilla. Thank you and will continue to follow you! I made this for our Church Thanksgiving last year and this year, none left to bring home!!!! Everyone wants the recipe and can’t believe how easy it is to make. Can this be made ahead of time, refrigerated, and then baked later in the day? My family loves this. I bake the bottom crust for 10 min. I also place a can of fruit over cream cheese mixture sometimes. I made it yesterday and it was received quite well. Nice! This was the featured recipe a week or so ago on allrecipes.com, so I guess it is definately a copycat. I am always happy that recipes are public domain, myself being a author of 2 cookbooks, unlike Martha Stewart who thinks recipes are HERS and HERS alone. Actually this is a recipe that I changed a bit from my recipe archive, I added the lemon to it, and I love the change. The original recipe is called Heather’s Sopapilla Cheesecake. Either way, I can tell you I love this recipe, and its very tasty, serve this, and you are unlikely to have any left overs. This looks really yummy and easy. I think I’ll try it for my next potluck!